The use of unfair trading practices constitutes a breach of the law against unfair competition. The principle of freedom of competition is vital to any market. Without it, there exists no protection against large companies' obtaining monopolies and then ruthlessly exercising market dominance. The ability of other companies to freely compete with such entities is necessary to protect consumers from, for example, highly inflated prices. On the other hand, the right to compete must be tempered to avoid abuse by traders using unscrupulous methods to sell products or services. Such misuse also threatens to impede the businesses of others and breach the principle of fair competition. This subject is particularly relevant in today's society, where competition plays such an important role and new technologies, such as the Internet, provide more and more room for competition. This special volume of the Comparative Law Yearbook of International Business addresses this important, controversial subject. It gives a country-by-country account of the provisions and procedures laid down in various jurisdictions worldwide. Each contribution is provided by a leading practitioner in the area of competition law. 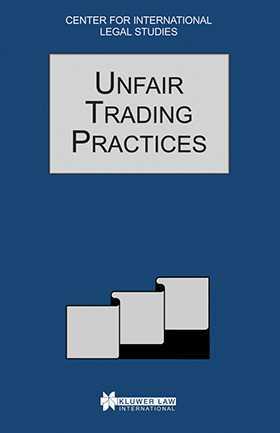 As a result, Unfair Trading Practices is a useful tool for anyone having to deal with unfair acts in the course of trading.